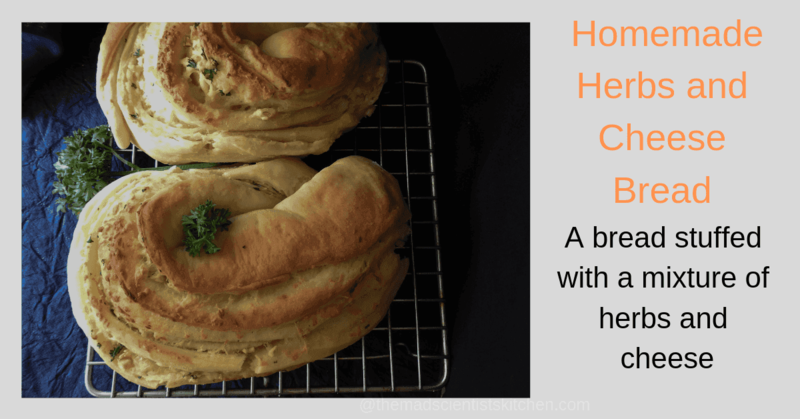 Delicious Homemade Soft Cheese Bread with Cheddar and Goat Cheese and Herbs is the yummiest bread. Bread is a special request from my girls especially the elder one. Every time she comes home she asks for bread. Can you believe she asked me for bread for her birthday? Like I said I love the new stuff and hate repeating the recipes but some bread like this one I will need no excuse to redo as the options for the stuffing can keep changing and it is delicious. 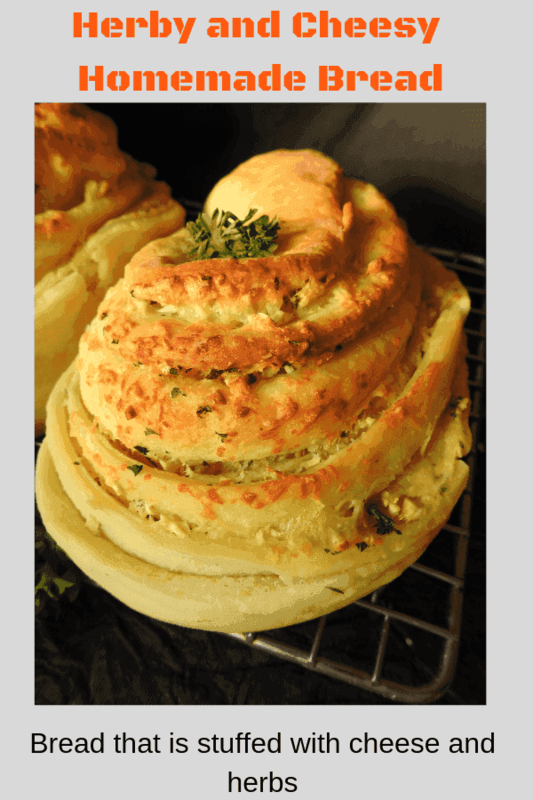 For #bread bakers today our Host Sue who blogs at Platable Pastime has chosen a theme as cheese bread. sue hasa beautiful site where I am eyeing some of her delicious bread like Savoury Almond Meal bread. This bread is great as a sandwich or toasted with soup, pasta. Next time I am going to try r to raise the dough overnight in the refrigerator. 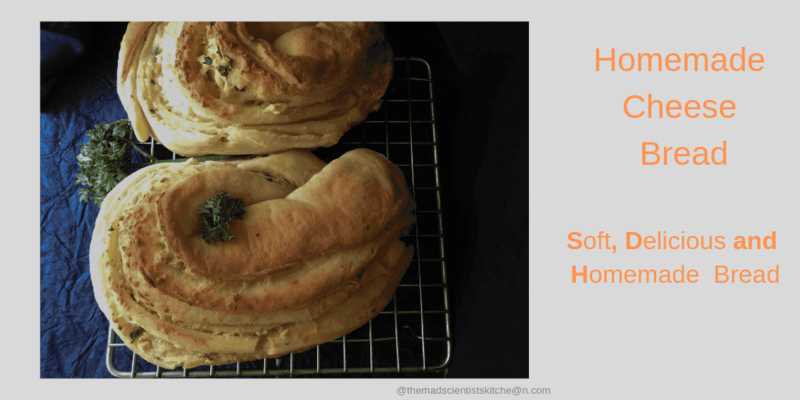 I have halved the ingredients and tried making 2 mini bread but I suggest you make only one if you are going to follow Jennifer ’s method of shaping the bread. Do have a look at the video before you make it. 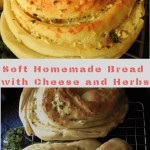 A soft and delicious cheese bread that can be varied with different cheese and herbs to suit your tastes. Set aside 1 cup of flour. In a mixing bowl combine the flour, salt, sugar and yeast together. In a bowl add the water and buttermilk, oil and add to the flour. Knead with your hand the dough. Add more flour or water, as you need and knead until the dough is soft and smooth but not sticky. Transfer the dough to a lightly floured surface and knead for a couple of minutes, then form dough into a ball. Lightly oil a bowl and place the dough in it. Cover the bowl with plastic wrap and allow to sit in a corner at room temperature until doubled in size say about 60 minutes. Grease 2 loaf pans the recommended is 8 inches by 4 inches. I used a cookie tray. Divide the dough in 2 equal pieces. Dust one of the pieces with flour( keep the other one covered) roll out with a rolling pin into a rectangle about 10inches by 16 inches. Spread ½ the butter on the rolled out rectangle sprinkle with ½ the herbs. Spread the ½ the cheese evenly on the dough. With the shortest end roll the dough into a cylinder and don’t forget to pinch the seam together. Take a sharp knife and cut the roll lengthwise. Do not cut through the dough. Rotate each piece so that the cut sides are facing upward and place them side-by-side. Pinch together the farthest end. My dough got over here but continue crisscrossing until you reach the end keeping the cut sides up as much as possible. Using a bench scraper lift the dough into the greased loaf pan. Towards the end say about 30 after kept for rising preheat oven to 350° F.
Bake for 45-50 minutes if the bread browns fast then tent it with a piece of aluminium foil. The bread should sound hollow when tapped. Remove the bread from the oven and allow to cool in the pans for about 10 minutes. Run a sharp knife around the edge of the bread. Carefully transfer the loves to a cooling rack. The loves need to cool for at least 1 -1/2 hour before slicing. Arch! I am SOOOO in love with the colour and shape of this bread, makes me want to grab it off the screen… yum is the word 🙂 very well done !!! Such a delicious bread, like your daughter I would’t mind having it everyday. Was just telling my hubby today that its difficult to find good bread nearby to where I live in Bangalore, so if I stayed here longer would need to bake them at home.Adding both cheddar and goat cheese must have made it so scrumptious. Aww, Mayuri! Here I was thinking you get everything in Bangalore. In Goa, we get plenty of bread you should come down here. Thanks the bread was delicious. Archana I too love baking breads with fillings, though most of breads have still to show up on my blog.. loved this cesy bread and especially the shape of it.. Beautifully baked with a lovely texture!! Thanks, Swati. Do post your bread. I will love to try them too.